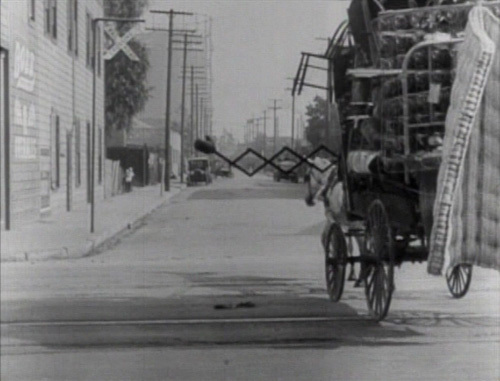 Cops is one of Buster Keaton’s best shorts—maybe the best. That's as close to a universally held opinion as you’ll find among silent film fans. How can I say this? Well, because Keaton’s body of work is known to almost anyone with even a beginner’s interest in silent films. If the quality of Cops was in dispute, there would be plenty of thoughtful voices to dispute it. Yet there are nearly none. I won’t dispute it either. I think Cops is a fantastic film—brisk, smart, cynical, and funny. It’s my personal favorite of Keaton’s shorts. I’ve seen it many times, but I’ve avoided writing about it in the past because it’s so hard to examine without spoiling, and because I questioned whether I’d have anything new to say about a film seen and loved by so many. The Last Laugh is about a doorman (Emil Jannings) who works at a fancy hotel. A towering, proud man dressed in a great coat with brass buttons and epaulets, the doorman served his employers ably for many years. But now he is old. Near the beginning of the film, he loses his job—and with it, the coat—to a younger man. Stripped of his coat, the doorman immediately crumples. He is nothing without it. Cops, too, is about the power of an outfit. In this case a police uniform—which closely resembles Jannings’ coat in The Last Laugh. Its core gag concerns civilians, whom Buster’s character believes he can safely tweak, turning out to be policemen—slipping on their coats and badges when he isn’t looking, and instantly becoming a threat to him. Cops is an extreme example of what policemen represented in a lot of silent comedies—they were typically heavies; often bullies who were given a wide berth and leeway to do what they pleased. They were obstacles for the hero; in practical terms no different from a thug, or boss, or an opponent across a boxing ring. The policeman’s necessary function in society was not dwelled upon in these comedies; even if it had been, this would not have made him sympathetic. When a figure in a silent comedy dons a policeman’s uniform, he leaves our side and joins the side of the adversary. If he was an adversary before, he is now an immeasurably more powerful one. And in Cops, figures like these become part of a literal army; each of them one more man in a massive, identically dressed crowd, chasing down the singular Buster for a crime he did not commit. It occurs to me that Buster’s character in Cops is more assertive than his little fellows tended to be—and yet, this one is his most persecuted. Cops has practically no plot. We see Buster at the start of the film, rejected by his girlfriend (Virginia Fox) because he hasn’t made it big in business. She seems well-off. Like most of Buster’s female leads, she is also cruel; making a demand of him that propels him on a dangerous and fruitless quest for approval. But the quest never really gets going in Cops. Whatever Buster might have planned to do is quickly sidetracked by events resulting from his inability to properly read what’s in front of him. A great deal happens over the next 18 minutes or so—most of which I can’t describe in detail, because to do so would be to spoil one gag after the next. These gags fall into three categories: things Buster knows that we don’t know; things we know that Buster doesn’t; and things neither of us know. The sudden donning of a policeman’s uniform by any man other than Buster would be an example of the third type. When Buster commandeers a horse and carriage so massively overloaded that he cannot see to his left or right, we have an example of the second type. When Buster is hiding onscreen, but we cannot see him, this is an example of the first. 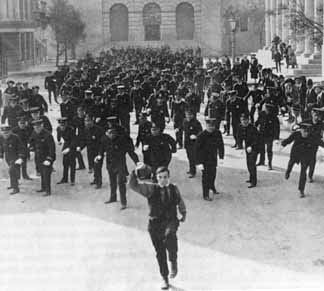 Cops is rightly most famous to its extended chase scene, in which Buster, suspected of being a terrorist, is pursued on foot by at least two hundred uniformed officers. The sight is so ludicrous that it becomes the joke. But the policemen in the chase are not particularly funny, at least as individuals, which is important. If you’re reading this, and you haven’t seen Cops, you might be imagining a Mack Sennett, Keystone Kops-style chase—a chaotic, gonzo mess of the type that brought so many Keystone films crashing to their conclusions. Not so here. The chase sequence is filmed mostly in longshot. This is necessary to emphasize the sheer numbers of men chasing Buster, but it’s also a shooting distance that eliminates Sennett’s brand of slapstick. And it must be this way. If the cops were total doofuses of the type seen in Sennett’s films, their numbers would make them more of a threat to each other than to the man they’re chasing. If they weren’t wearing those coats, they’d still be scary, I suppose. But they’d be something else. A riot, maybe. Something needing to be quelled, now. That would not a job for you or me, or poor Buster, though—that would be a job for the police. And what, when a crowd of unknowns bore down on you, would the sight of a policeman’s uniform mean then? 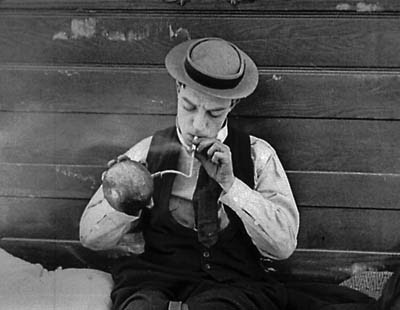 Cops is available on Blu-ray and DVD, part of Kino International’s Buster Keaton: The Short Films Collection (1920 − 1923). 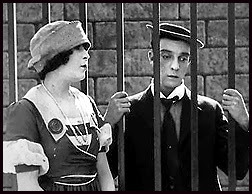 Keaton explored the comic potential of the numbers game a second time in Seven Chances (1925)—this time swapping cops for brides. Read my post on Seven Chances here. This short is included on the blu-ray set a bought of Keaton's work, but I haven't watched it yet. I am going to pull it out and watch it today with my kids. I love everything I have ever seen of Keaton's but until recently I have mostly only seen his film. Now I have found myself catching up on all the shorts that I had missed. Thanks for the post. Friends with kids often tell me how popular Chaplin is with their little ones--I wonder if it's the same with Keaton? He 'gives' less to the audience, and he's less acrobatic. Nice write-up of a great comedy. I found your tie-in to THE LAST LAUGH thought-provoking as well. Well done!